The second biggest city in Rajasthan, popularly known as ‘The Blue City’ or ‘Sun City’ - Jodhpur has a royal history of breathtaking royal palaces, along with other fort venues in Jodhpur that provide a range of exotic views to host an unforgettable event at. The city offers beautiful natural décor as its backdrop as well as the royal Havelis, which prove to be a luxurious venue to host a destination event in style. Offering picture-perfect pavilions and legendary premises for an extraordinary celebration, there are several wedding venues in Jodhpur where one can find infinite choices of classic heritage, royalty, and hospitality. If you’re looking for some local sight visits then these are not to be missed – Jaisalmer Fort, Camel Safari, Sam Sand Dunes, Gadi Sagar Lake, Patwa ki Haweli, etc. You can use the Indian Rupee as a mode of exchange in the city. People in Jaisalmer speak Hindi, Urdu, and Rajasthani for communication. If you’re looking for some local sight visits in Jodhpur then these are not to be missed – Mehrangarh Fort, Mandore Gardens, Kailana Lake, Rao Jodha Desert Rock Park, Clock Tower, etc. You can use the Indian Rupee as a mode of exchange in the city. People in Jodhpur speak Hindi, Marwari, and Rajasthani for communication. Combining tradition with modern amenities, ITC WelcomHotel in Shikargarh Uchiyarda is intelligently designed by a sense of harmony to bring unique experience to the guests. Among the many 5 Star wedding venues in Uchiyarda, Welcomhotel is located in the scenic locales of Jodhpur, on the edge of the Thar Desert, set against the somber and arid landscape of Rajasthan. As one of the luxury wedding venues in Uchiyarda, the hotel is marketed and managed by India’s foremost name in the hospitality industry ITC Hotels. The Hotel is under the brand name Welcomhotel Jodhpur. Spread over 10 acres, this destination wedding venue in Uchiyarda is a tribute to the city of Jodhpur, laden with history, culture & monuments that enliven the royal era of the princely state. Amidst the wedding venues in Uchiyarda, Welcomhotel Jodhpur endeavors to bring about an element of grandeur through food, music, colour and an ethnic mélange of unique experiences. In terms of event venues in Uchiyarda, WelcomHotel Jodhpur provides multiple banquet halls for weddings and receptions that can also be combined for any event. Besides their banquet halls in Uchiyard, the venue also lets you host open-air wedding functions and ceremonies in its gorgeous lawn and is a perfect venue for all your social events, including corporate events in Uchiyarda. With splendid display of luxurious Rooms, exclusive F&B outlets, rambling courtyards, landscaped gardens and banquets. Book this banquet hall in Uchiyarda which also provides the finest culinary experiences for a capacity of upto 1500 guests. 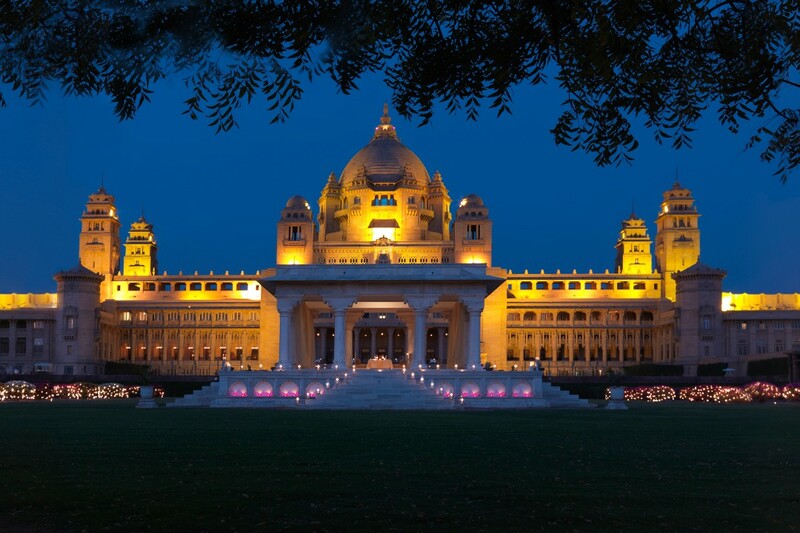 Built between 1928 and 1943.Umaid Bhawan Palace in Cantt Area, Jodhpur is one of the best options for a memorable wedding at heritage hotels of India. Where fairytale weddings gets accomplished at this destination wedding venue in Cantt Area, as an ideal location for its lavish and grand wedding celebration. This enchanting venue of luxury wedding venues in Cantt Area is one of the most magnificent ,opulent and world’s sixth-largest private residence palace of Rajasthan's heritage in the world. Inspiring with exotic views of the history, this 5 Star wedding venue in Cantt Area is a masterpiece of royalty and heritage, sprawled across 26 acres of lush gardens. The Palace as one of the event venues in Cantt Area is a merger of eastern and western architectural influences and undoubtedly it provides splendid wedding venues in Cantt Area for holding dream weddings. Home to lavish front lawns and the grand Marwar Hall, this 15th century palace is much famed for the most upscale weddings at its banquet halls in Cantt Area. Book this banquet hall in Cantt Area which can hold up to 900 guests in its lawn and banquet. The lush green gardens with dancing peacocks and subterranean Zodiac Pool this five-star hotel is a perfect location for a royal destination wedding. It also makes for an impeccable corporate events venue in Cantt Area.Plush courtyards, rippling fountains and lawns, exquisite exteriors and interiors, specialized theme restaurants and professional staff, makes it one of the best wedding venues in India. 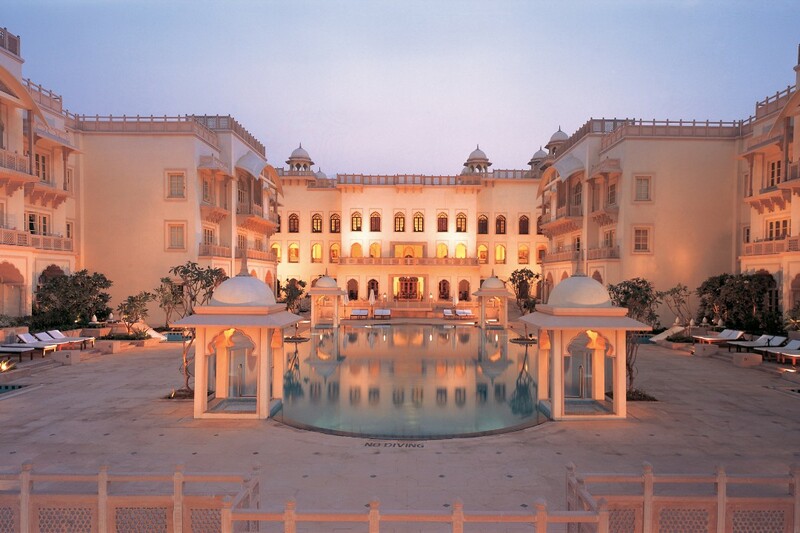 Vivanta by Taj - Hari Mahal is located right at the edge of the seemingly endless Thar Desert in Jodhpur. At the very heart of deserts, the palace of the 21st century, offers luxurious refinement, spread over six acres of lush, landscaped gardens as one of the palatial wedding destinations in Jodhpur. Built to resemble a 14th century royal palace with the fusion of Marwar architecture with Moghul-inspired domes is what makes Taj Hari Mahal Palace an extravagance among the many destination wedding venues in Jodhpur. Being one of the luxury hotels in Jodhpur, Hari Mahal offers splendidly rich interiors and provides with an unmatched hospitality which will only leave one pleased and speechless.The art decoration style of this luxury accommodation in Jodhpur, dating back to 1940 during the time when the hotel was the residence of the maharajas. Vivanta Hari Mahal delivers over 28,000 square feet of event venues, which are available for power meetings, memorable brand launches, conferences, events or upscale palace weddings in Jodhpur. The hotel is a perfect synthesis of the charms of a bygone era and modern amenities and hence is popular for destinations wedding in Jodhpur to to tie the knot in this luxurious property among many couples. 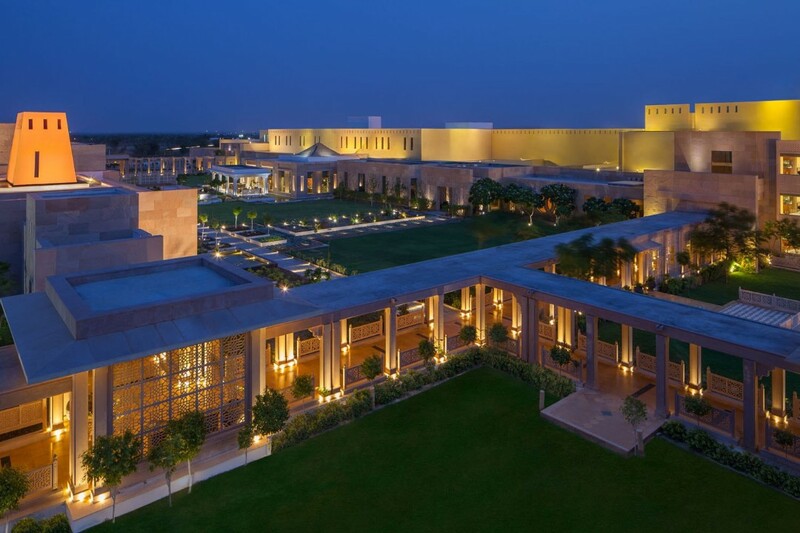 While on one hand, the hotel offers a delightful holidaying experience to those on the quest to quench their wanderlust.Defined by its heritage and colonial charm, Vivanta by Taj - Hari Mahal has a venue space which can hold a capacity of 800 guests with the assurance that all guests have an unforgettable experience.